Trump asking if Obama ever talks with members of Congress anymore. Hours after Obama had a bipartisan meeting withe Senators on SCOTUS. I just watched Ben Carson’s whole speech and I genuinely cannot tell you if he dropped out or not. Pretty sure he didn’t. Pat Mast co-chair of Republican House District 7A in East Duluth said "i've never seen a caucus like this one before. We had hundreds of people attending. I've been doing these for about 20 years and this is absolutely a record breaker for attendance." Trump says Rubio "decided to become Don Rickles. But Don Rickles has a lot more talent." Marco Rubio, the only Republican to make a Minnesota campaign stop ahead of Super Tuesday, has an early lead in the state's GOP caucus. If he prevails, it will be his first primary or caucus win this season. Here he is on Tuesday in Andover, Minn. earlier today. 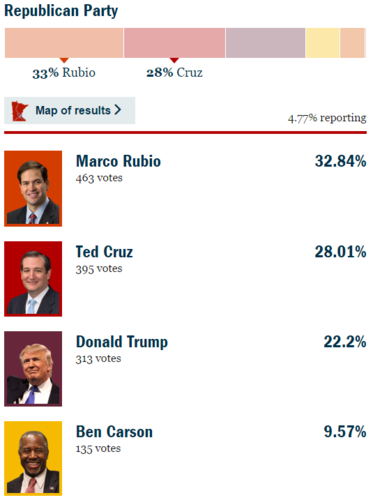 "This could be a very big night for Rubio" in Minnesota, said political analyst Maureen Shaver on MPR News just now. 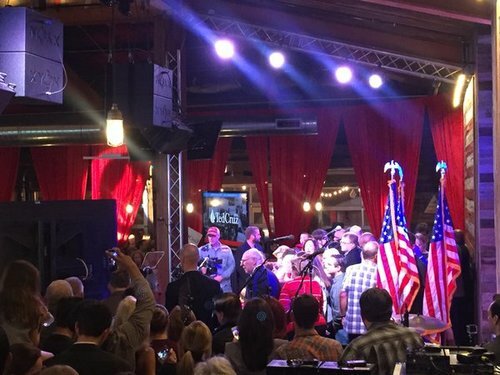 MC at Cruz party says Cruz wants to come out but CNN and Fox are still on the "bloviating buffoon" who "won't stop talking"
MPR News political analyst Todd Rapp on MPR News just now: "We're going to make news because we are an outlier." At DFL HQ, early numbers give edge to Sanders in CD 1, 2, 4, 5, 6, 7, 8, Clinton in CD3. 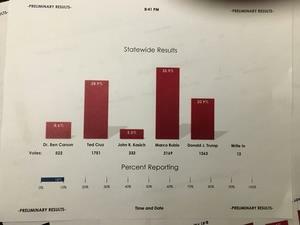 Less than 10% in. Trump's strategy appears to have become simply argue everyone else shouldn't be on the ballot. Process of elimination? 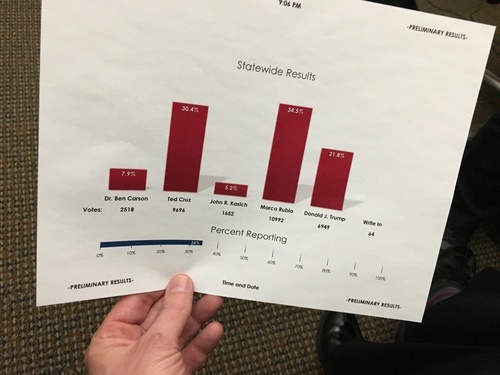 Results from the Minnesota caucuses are starting to come in. See the national and state results here. SLIGHT CLARIFICATION: Rick Scott is in Tallahassee and not endorsing Donald Trump TONIGHT. Spokeswoman says he hasn't made up his mind. The message so far from Minnesota's Republicans seems to be "Not Trump." A couple of months ago, the conventional wisdom was that Donald Trump was banking on the support of white working class voters. 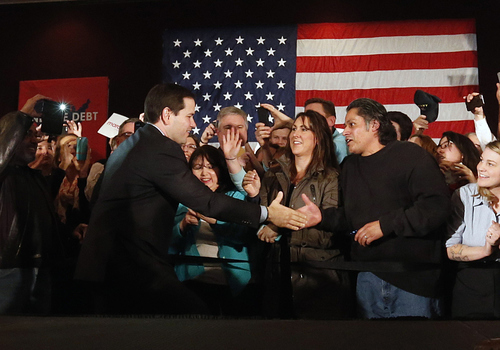 And, tonight, he certainly did well with the non-college population; he overwhelmingly won their support. But early exit polls also suggest the business man-turned politician has built a much broader coalition. In Massachusetts, a majority of GOP primary voters had a college degree. And, Trump seems to have won college grads overwhelmingly. Early exit polls show he had 45 percent to Ohio governor John Kasich's 21 percent and Florida Senator Marco Rubio's 19 percent. The three of them were in a virtual tie among post-graduates. Keep in mind, of course, we don't have the margin of error for these polls. In Alabama, Georgia, and Tennessee it was a similar story. Trump won college grads. The picture is more complicated in Texas, Oklahoma, Virginia, and Arkansas. But the exit polls suggest even if Trump did not win college voters, he came close. And, the results debunk the idea that Trump has a ceiling limited to white working class voters. "You know this campaign is pretty crazy stuff. But you know what, there have been so many precious moments. And moments that have changed my life." "If we continue to spend money like drunken sailors ... if you don't have fiscal responsibility, you can't make it." "I do not believe that economic growth is an end unto itself. Sometimes they call me a different kind of Republican, and I welcome that. You see, I don't believe that in the United States of America, the mentally ill ought to be living in prisons or sleeping under a bridge. I think it's time to put the resources towards helping them to get on their feet and get their God-given destiny." Texas Lt. Gov Dan Patrick: "We told Donald Trump, don't mess with Texas!" Dan Patrick: "After tonight, it's a one-man show." UPDATE: With 12.36% of DFL precincts in, Sanders 6396, Clinton 4365.